I was at the girls' school for their Book Fair and Parent-Teacher Conference this morning that's why I'm posting late today! 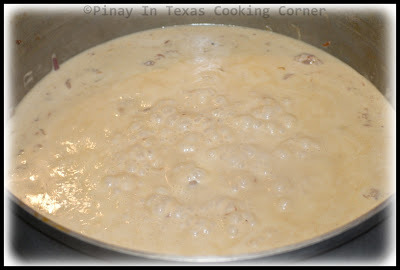 Anyway, I'm here now to share with you another popular dish from Region V, Philippines (most commonly known as Bicol Region). This is called Laing which is basically Taro Leaves in Coconut Milk. 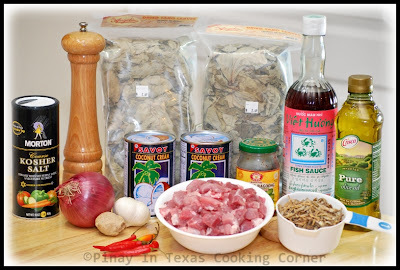 Just like the Bicol Express, I was introduced to this dish by my Bicolano friends in college, who like all people of Region V, are known for their preference for hot and spicy food. 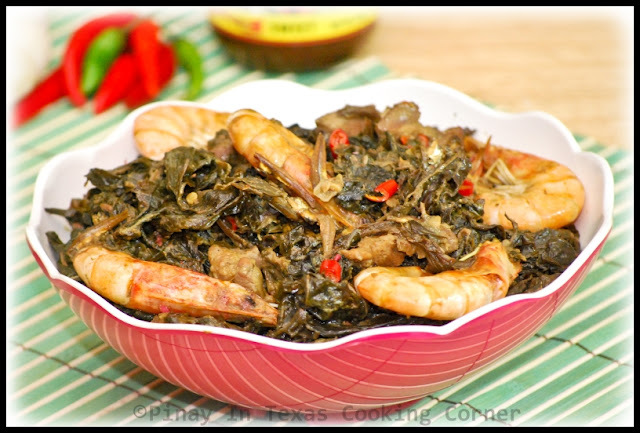 Laing is another popular spicy dish wherein gabi(taro) stalks and leaves are slowly cooked in coconut milk seasoned with ginger, shrimp paste and siling labuyo (bird's eye chili). 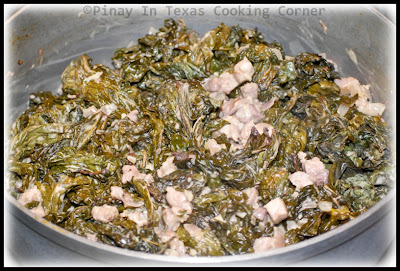 Though I've loved Laing since I was in college, I never tried cooking this when I was still in the Philippines. I've always thought that preparing it is so time consuming. 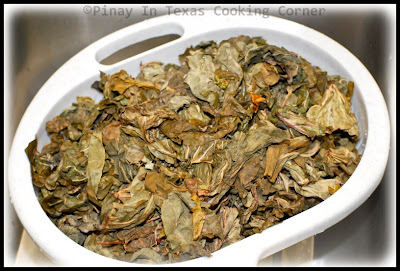 Not only do you have to dry the leaves and stalks for a couple of days, you also have to shred them one by one. It's good that here in the US, packed ready-to-cook taro leaves are available in Asian stores. But beware in buying packed taro leaves. There are some brands which contain some other variety of leaves aside from taro. There is even this one brand that I tried which had dried carabao grass in it. The "Angelina" brand has so far been the best I've found, but be sure to still wash the shredded leaves thoroughly just to make sure that all the dust accumulated from drying will be all be gone. When cooked properly, taro leaves will result in this very appetizing dish (I know it doesn't look that appetizing...but it is!) that you'll surely love! You can eat it alone with rice or you can use it to go with fried meat or fish. 1. Thoroughly wash the taro leaves. Drain. 2. 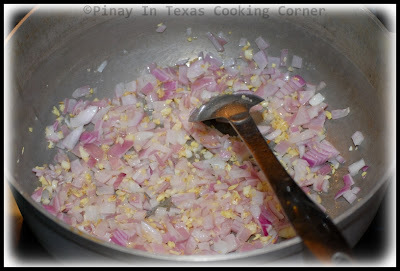 In a large saucepan over medium heat,s aute garlic, ginger and onions in olive oil until onions are translucent. 3. 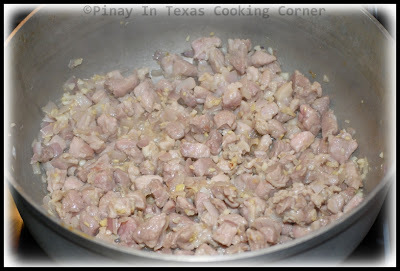 Add pork and saute until juice starts to come out. 4. 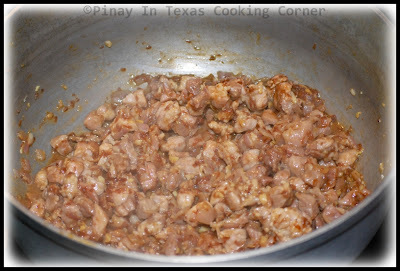 Add shrimp paste, saute for a minute. 5. Pour in coconut cream and fish sauce. Bring to a boil and simmer for 5 minutes. 6. Reduce heat to medium low. Add taro leaves. Submerge them in coconut milk by pressing them down with a basting spoon or ladle. Do not stir during the first 25 minutes of cooking, otherwise it will cause an itching sensation in your tongue when eating the dish. Simmer for about 25-30 minutes or until pork and taro leaves are tender. 7. Add anchovies, shrimps and chilies. Mix well. Simmer for another 5 minutes. 8. Remove from heat. Serve with hot rice. Hey Tina, this is such an interesting dish for me. 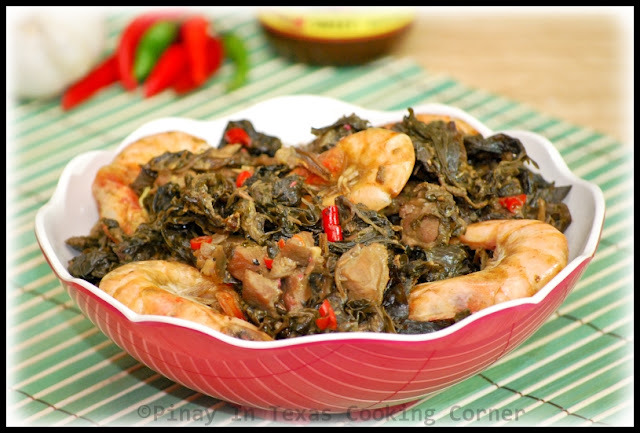 I've not tried Taro leaves & I love prawns!! I am not sure what Taro leaves are Tina but sure the outcome is something we will enjoy, how not to with chillies and coconut milk, so Asian in cooking. Dried taro leaves? I don't believe I've ever seen them on sale before, fresh or dried. We do cook tapioca leaves a similar way here and I love it! I'm imagining this to be similar in texture and taste to that. I've never had taro leaves... I SOOOOO want to try this Tina! Very interesting and exotic recipe! I have never cooked laing but I do love eating it. I know what you mean when you say it is lacking in good looks. So good with rice. @Nava: I've read that taro is the same as the keladi or what you call yum in Malaysia. This is definitely new to me. I have tried sweet potato leaves but not taro leaves. Looks very tasty with the shrimps. We make curries with fresh taro leaves, dried one I haven't seen much. Looks awesome as it contains coconut milk. Never used taro leaves before, but this seems like a great way to try it out! Taro leaves are new ingredient for me! But the other flavours sound delicious. I'm not familiar with taro leaves, but will look for them next time I'm in the Asian market! I cooked this several times, it turns out the taro leaves still hard, so I have to cook it couple of hours or soak the leaves overnight before cooking.